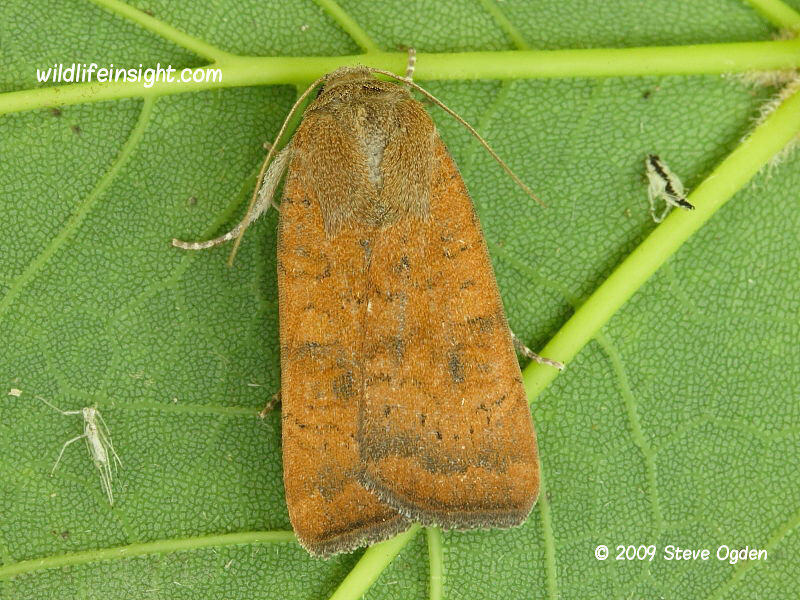 Least Yellow Underwing Moth, Noctua interjecta. The Least Yellow Underwing Moth flies in a single generation in July and August. In the British Isles the species is most commonly recorded in the southern half of England. However, it’s not as frequently recorded at light as the more common Large and Lesser Yellow Underwings. Its range also includes much of Europe. With a wingspan of up to 17 mm it’s the smallest of the Yellow Underwing species to be found in the British Isles. As with other Yellow Underwing species the hindwings are yellow with a black sub terminal band and hidden when at rest. Other common Yellow Underwing species include the Large Yellow Underwing, Lesser Yellow Underwing, Broad-bordered Yellow Underwing and Lesser Broad-bordered Yellow Underwing. The caterpillars of the Least Yellow Underwing are up to 40mm in length and feed on a a wide variety of herbaceous plants. The caterpillars overwinter when partially grown.